Austrian – O Hei There! 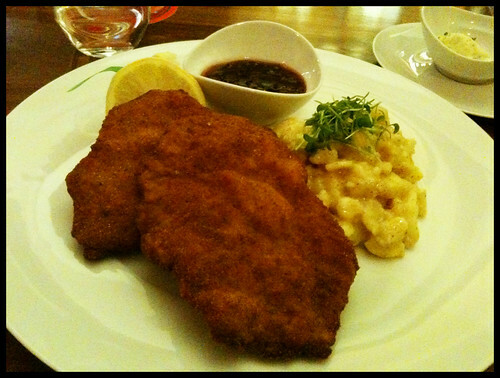 An authentic Austrian restaurant in LA? Ha! Talk about a rarity – it’s like catching Mew in the original Pokemon. 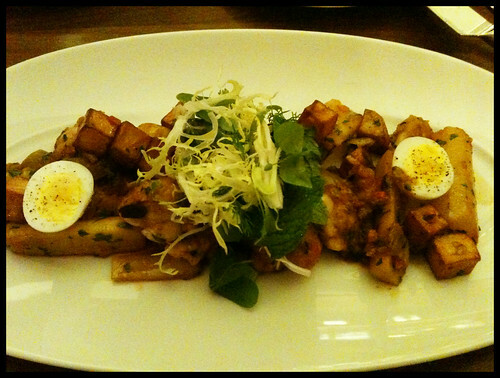 Despite having one of the country’s most prominent chefs and restaurateurs in Austrian Wolfgang Puck in the city, his presence in LA over the decades had not produced a single restaurant dedicated to serving food from his homeland (although Spago used to have some Austrian dishes before the renovation last year). Maybe there have been some under-the-radar restaurants that serve legit Austrian fare in the city, but I’ve yet to read or hear about them – that is, until BierBeisl opened early last year. Located on Little Santa Monica Blvd in Beverly Hills, BierBeisl is run by Chef Bernhard Mairinger, whose statuesque appearance belongs more as a center on my pick-up basketball team rather than hunching over in his miniature kitchen whipping out Austrian classics. An Austrian himself, Chef Mairinger was probably fed up with the lack of Austrian culinary options in the city, and decided to do something about it himself. 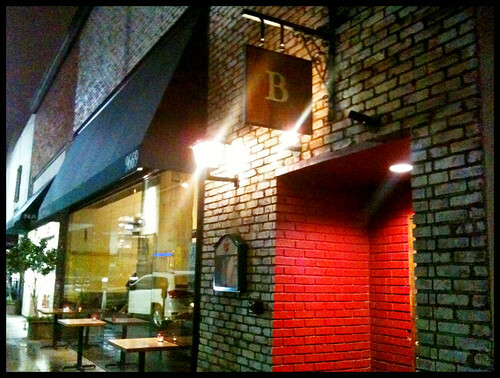 Since it’s opening, BierBeisl has racked up some impressive accolades, including a James Beard Semifinalist nomination for Chef, and a spot on Jonathan Gold and LA Weekly’s respective Top 101/99 lists of 2013. I visited BierBeisl twice, once before their “spring break” (they took a week off for vacation in March I think), and once after. That was also the time they rolled out their happy hour menu. Not advertised anywhere (including their own website – I believe I found out via LAist), the happy hour menu consists of their entire sausage menu being priced at $7 (dinner menu prices $8-12), as well as select draft beer priced at $7 as well – 4-6pm weekdays. On my first visit, I tried the kasekrainer, which is a Polish-esque sausage that was stuffed with Swiss cheese that oozed out beautifully when bitten. 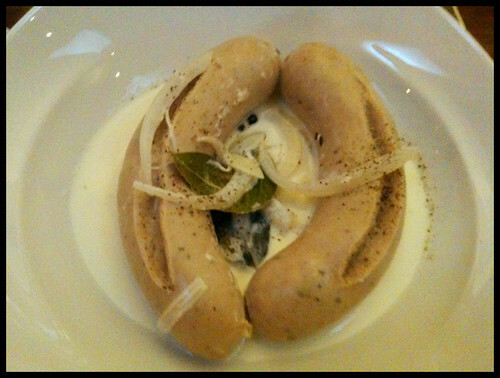 On my second visit, I tried the weisswurst, a veal sausage simmered in milk and onions. Its flavor is much more mild than the kasekrainer, which had a nice combination of salty and peppery flavors. 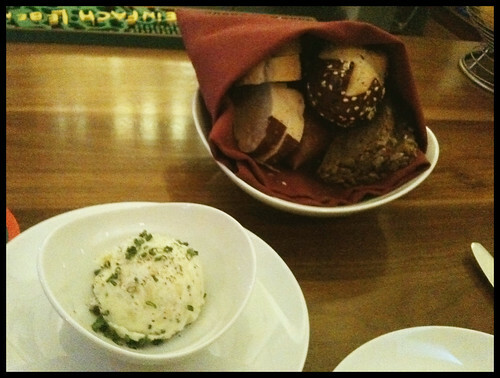 The weisswurst, which comes in a pair, was much more refined, perhaps even too much so. Definitely stick to the kasekrainer – that’s what everyone else does. 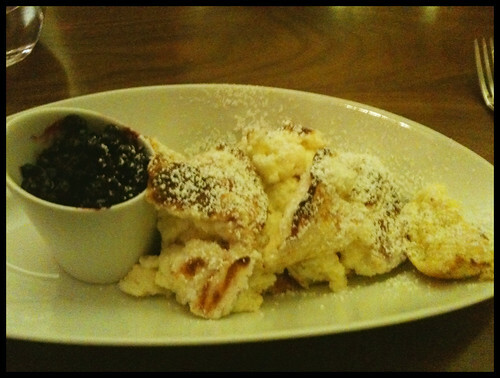 Definitely don’t forget dessert while dining at BierBeisl. For those of you saddened by the removal of it from Spago’s menu, you might not miss a beat eating the version of kaiserschmarrn here. Think of it as a cross between pancake and crepe, shredded but kept fluffy with a slight crust. Amazing. Not as amazing was the “secret” dessert from the following visit. 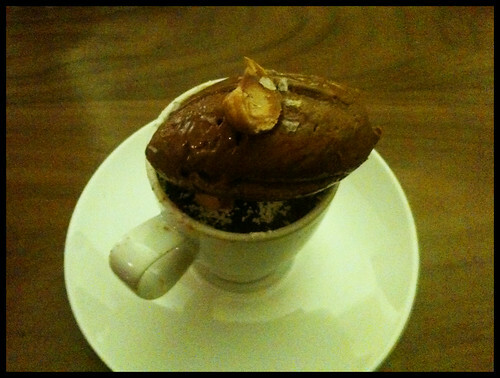 I forgot the exact name for it, but it was basically a mini chocolate souffle of sorts, topped with a scoop of gianduja gelato, hazelnut, and a hint of sea salt. It was pretty good, but standard, and not worth the $12. I will have to try the apfelstrudel (apple strudel) next time. Also don’t forget to try the different Austrian and German beers available, as well as trying legit schnapps (not the fruity crap that fucked you up in college). This was my first and second time trying authentic Austrian cuisine, and it is something both homey and sophisticated, while being just downright delicious. This type of sophistication is something you don’t expect to find in the heart of Beverly Hills (that’s right, I didn’t stutter). I sat at the bar on both visits, and had a great time chatting with the staff (with Shalimar in particular), while also learning a lot (including how Austrian food is NOT German food haha). Despite its accolades and distinction as a hot spot in the likes of The Hollywood Reporter, the restaurant didn’t seem very busy during my dinners (but that could be because I was eating at 6pm). Note: 2 hour free parking in the lot across the street on Roxbury.